The serious workaholics over at the MIUI Forums are doing something right. Only they could get me to run a somewhat Apple UI on my OG Droid. “Tim, what the heck are you doing?! ?” is something that I’m expecting to hear, but let me tell you something – I really enjoy this! They have reinvented the way I use my phone….again! With an insane amount of themes (easily switchable) what more could you ask for? Back in September we featured an awesome video showing off what MIUI had to offer, but now, this version which we are showcasing here is for the Original DROID 1 only. Be on the lookout for different versions for you favorite device. It has some insane features currently not availble for anything else. You’ll find tons of toggles in the pull down bar, changeable lockscreen wallpaper, black and white list of phone numbers, whole new phone.apk UI, etc. etc. My list goes on. 2. Boot into Recovery and make a Backup. Because you never know! 3. After backup, wipe data/cache. Full factory reset. 4. Install ROM from SD and choose the MIUI zip. After installation, enjoy your new phone! Got any probelems? Questions? Concerns? Cats?? Then ask away in the #droidlife IRC channel or here in our very helpful comment section! Thanks! Huge thanks to the entire MIUI Team and especially metiCkOne, Jamezelle, n_i_x and MarkHUK. See their original post HERE. 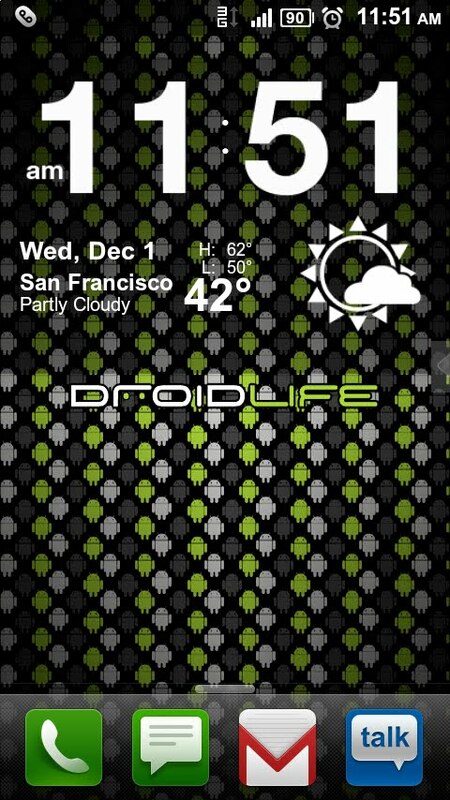 You can find the wallpaper featured in the Droid Life Wallpaper App and that clock is just Beautiful Widgets. Wednesday Poll: Thoughts on Verizon's 4G LTE Network?